Is this class really worth 80 lines of test code? 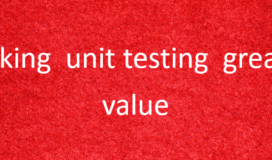 And now we really have nothing worth unit testing in InspectorContext. It is pure “orchestrator” and we gained something actually useful: a specialty decision maker, that we can reuse throughout our code base. We can now safely do what I love doing most: Delete useless code, and delete the 80+ lines of test code in the InspectorContextShould file.